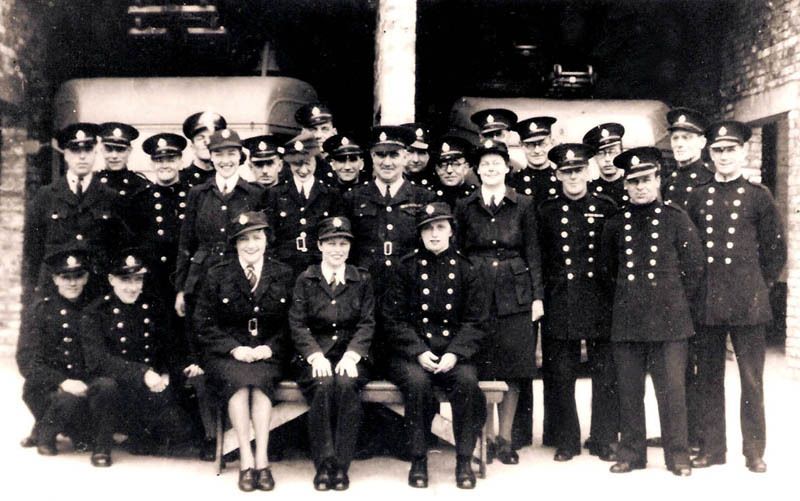 Staff at the old Banstead Fire Station. When was it taken? Can you name anyone in the photo? Are you or a member of your family in it? No. 19 Francis 'Jack ' Burrows. Do you know any stories about the Banstead Fire Station and any significant incidents they attended? Banstead was given the station reference "B2" ~ Reigate was the Divisional headquarters and was "B1". The fire engines in your photograph of the AFS crews are almost hidden but having studied the 'seams' over the doors for some time, I think I can identify them, and have enclosed photographs of the relevant machines. Fordson heavy pump: a 2nd World war government issue designed mainly as an escape carrier. 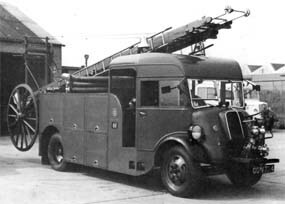 The 'Barton' pump, seen on the front,would have been fitted after the war in an effort to equip the local fire brigades with an inexpensive dual-purpose machine with a 50 foot ladder and a pumping capability. For wartime purposes, both machines would have been painted in grey and fitted with headlight covers. Michael continues - I was an avid fire brigade enthusiast and spent many hours outside Sutton Fire Station (which was then in Throwley Road). Calls to summer heath fires on Belmont and Banstead Downs were often attended by a pump from Sutton and a water tender from Banstead, so I became familiar with the machines and men (men only in those days!) who fought the flames. I have also attached reference to the fire engines which served Banstead after the second World War. 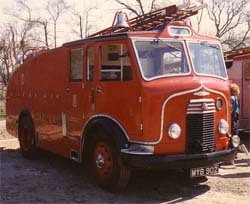 Being a largely rural area and with no high buildings Banstead was reduced to one appliance only by the Surrey Fire Brigade when it took over responsibility after the War. Any serious fire in Banstead always required an additional attendance from Sutton, Epsom or Reigate. only one appliance in about 1949. It was later superceded by a Dennis F-series water tender. This photograph shows the old Fire Station building. There were originally five appliance bays - little more than garages. Each bay was very basic and had two hinged doors. Accommodation for firemen, plus staff offices and the watchroom, were housed in a separate building to the immediate south of this block. On this day, the Waitrose supermarket was destroyed by a huge blaze and explosion. Over 100 firefighters attended and ten fire engines and two ladder platforms were used to get the fire under control. Four firefighters suffered minor injuries. No customers or staff were hurt. Until 1938 Banstead's fire services were provided by brigades in Epsom, Coulsdon and Reigate. The increasing rise of bombing raids to quell civilian populations as at Gernica during the Spanish Civil War (1936-9) or Mussolini's invasion of Abyssinia (1935-6) prompted the British government to introduce the 1937 Air Raid Precautions Act where local authorities were formally required to submit their plans compliant to the Act for government approval. It was proposed to acquire a fire motor pump of 350/450 gallons per minute capacity, a motor fire tender, motor ambulance and all other necessary equipment such as ladders, hose, standpipes etc. 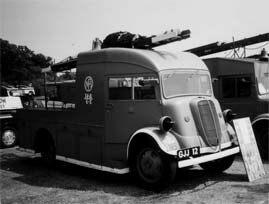 The delivery of such equipment was not quick, as a report of an exercise on 10 June describes the Auxiliary Fighting Service taking part "with motor cars representing Fire Engines which unfortunately still do not exist in Banstead". 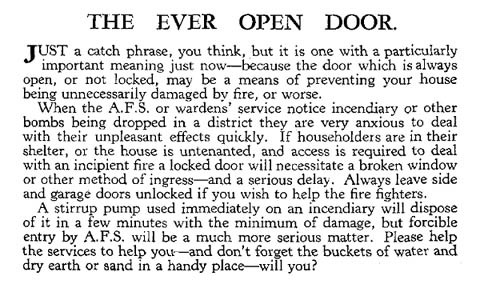 With the advent of war, by early 1940 this extended to road wardens, (neighbours taking it in turns to fire watch and deal with incendiaries) and the exhortation to every home-owner to leave "An Ever Open Door" in their houses so that quick and easy access could be gained in the event of damage by fire 'or worse'. Banstead's Fire Station remained until July 1960 when it was closed after Surrey County Council's 1959 decision that the site was unsuitable. 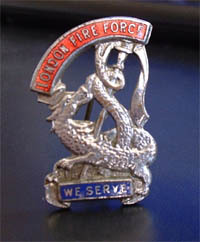 The arrangements reverted to those of pre-war, with Banstead relying on stations in Epsom, Sutton and Reigate for its fire service. The worst fears of local objectors to its closure were realised some years later when a fire at the children's home, Beechholme, in Fir Tree Road, gutted their church with its recently installed stained glass windows. 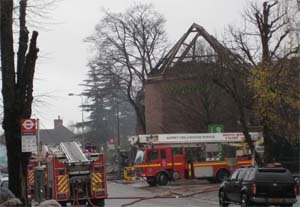 The new arrangements meant that fire crews were summoned from outside the Banstead. Mr Banner, the superintendent, lamented the closure of Banstead Fire Station. "I am not saying anything against the firemen, they did a magnificent job,but if the fire station were nearer, they would have got here sooner ". Number 21 in the group photo is my father G A F King - 'Georgie'. George was apprenticed to a stables in Lamborn at the age of twelve and at the end of his apprenticeship he moved to Epsom. Unfortunatelyin 1938 he suffered a serious fall and had to retire as a jockey, however this setback never stopped him from pursuing a physically demanding job. He joined the AFS in January 1940 and after training passed out as Firefighter/dispatch rider. The AFS was a bit of an ad hoc organisation; Georgie was only 4ft 11.5 inches and, took a size 5 shoe and his initial uniform was a tin helmet, boiler suit and a pair of wellington boots. He initially served in Walto-on-Thames but moved back to Epson where he was based at Epsom Fire Station, however, unlike the crews who trained as teams, even though Georgie could man the pumps and did so during the blitz, the d/rs lead a solitary life and were sent where needed. 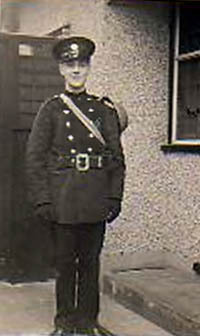 He served at Epsom, Surbiton and Carshalton where this photo was taken in 1942, before finishing up at Banstead. That is the family connection to Banstead. My mother's sister, Mabel (May) lived in Firtree Road as I did for a year or so. I went to school in Banstead where the headmaster was Mr Paul and my aunt was, for several years, during and after the war the barmaid at The Wheatsheaf. Georgie's first motorbike was a water-cooled Scott and when this fell to bits he acquired an AJS and finally the standard issue BSA. It is difficult in these days of instant communication to understand the purpose and value of the d/rs, but their duties were to communicate between the units and base as not all the pumps had radios and those that did were not very efficient. It was a very dangerous job as it meant travelling in the dark with a shrouded headlamp which gave a thin beam of light about 6ft in front, and apart from the danger of exploding bombs they also had to watch out for debris and bomb craters in the road. I remember at the height of the blitz standing with my mother watching the red glow in the sky as the docks burned. During the war, the fire service normally worked 48 hours on and 24 off. At the height of the blitz dad went to work having been seconded to Brixton; he came home 6 days later, filthy dirty and badly bruised. During that short time, he had apparently been blown off his bike 3 times - once through a shop window. 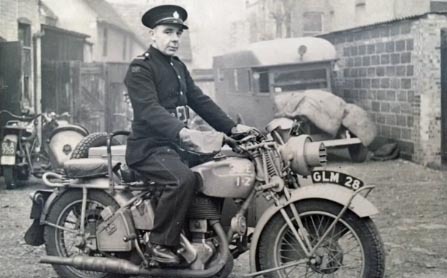 In 1943 the Fire Service Benevolent Fund was formed and he became a founder member of the motorbike display team which toured the local south east area raising money for dependents of the fireman killed or injured whilst on duty. His partner was Triss Sharpe who was the 1928 world champion speedway rider and captain of Crystal Palace speedway team. 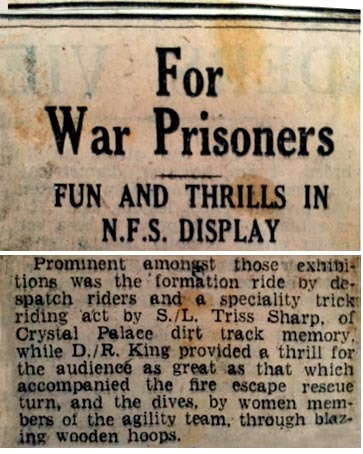 Together they performed a number of impressive and dangerous stunts. The newspaper cutting on the left shows that the reporter was most impressed by Triss' and Georgie's spectacular stunts. One such stunt had to be performed at quite a fast speed to gain the benefit of centrifugal force as Triss would lean the combination motorcycle and sidecar over, while dad calmly removed wheel of the moving motorbike. He then climbed on Triss's shoulders as seen in the photo below. After a couple of circuits of the arena dad would dismount, replace the wheel then the combination would be dropped onto all three wheels. For their finale, Triss would ride in solo and stop and talk to another member of the team by which time the bike would run away. Triss would chase it around the arena through and over obstacles including a ramp and jumping through a ring. 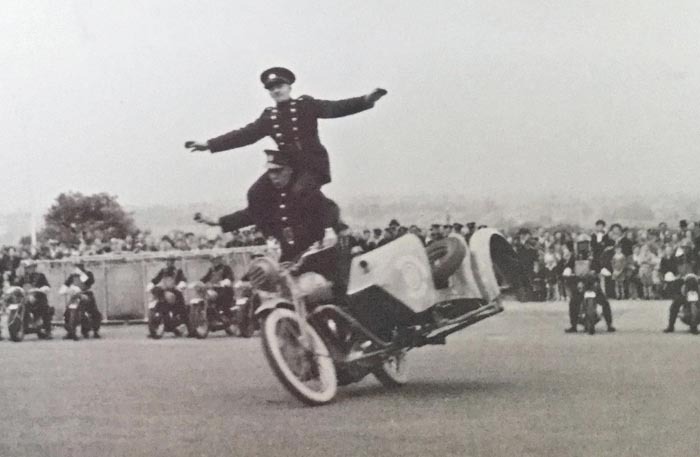 When he finally caught the errant bike and stopped it, dad would emerge from under the false floor in the sidecar where he had been controlling the outfit via a periscope and controlling the steering, brakes, throttle and clutch by cables. This was just one of the many stunts the team showed for the public’s entertainment. Georgie was demobbed in 1945 when the war finished but under the direction of Labour which was in force at that time he was sent to Fordingbridge in Hampshire to work in a saw mill. Georgie King lived in Surrey all his life and died in Stonleigh in 1982. 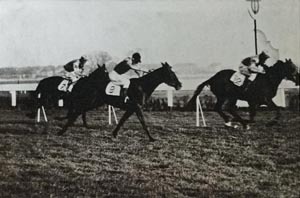 The photo shows Georgie (centre) on horse number. 9. I have a photo of my father in uniform ready for fire fighting, with safety helmet, boots and waterproof trousers. Held by his belt was his axe. He joined the Banstead Brigade as an Auxiliary Fire Service (AFS) and later had to change all his buttons to the National Fire Service (NFS). They linked with London Fire Brigades during the war and he regularly fought fires in London. One night he was part of a patrol on the London docks, walked to the end of his section and turned as a bomb exploded from the area he had just walked over. From our bedroom window in a house off Wilmot Way we could see the blaze over London; it was possible to see the dome of St Paul's cathedral on a clear day. We often wondered if he would come home safely. 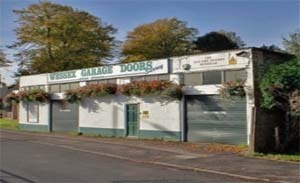 Reference the photograph of BANSTEAD FIRE STATION and your requests for any relative information. My name is Richard Wilman, and I lived with my parents and brother at 33 Winkworth Road, Banstead. 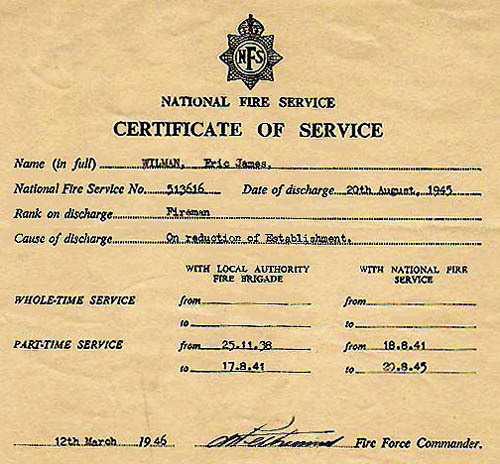 My Father joined the National Fire Service, Local Authority Fire Brigade, as a part time fireman in 1938 based at the new Banstead Fire Station. In 1941 he was "transferred" into the Auxiliary Fire Service as a part time fireman. During the day he worked at Barclays Bank, in Sutton. With regard to the group photo, my wife and I, my Brother and his wife, and our daughter are 99.9% certain that No. 8 in the photo is my Father, Eric James Wilman. My father never recounted any of his fire fighting experiences directly to me during the War, but I believe he saw action in London. Like Margaret Dickens, I remember vividly the London Blitz with the night sky and horizon highly illuminated in red and oranges. From my bedroom window we looked out right across to London and could also see Saint Paul's cathedral on a clear day. - NFS letter regarding his demobilisation. My brother, Paul, and I are almost certain the No. 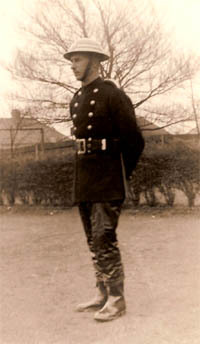 19 on your photo of Banstead firemen is our father Francis Burrows (1906--1980), always known as Jack. Dad joined the auxiliary fire service after he was rejected by the army because of his poor eyesight and flat feet. He served from early in the war until about 1946. He seldom talked about his fire service experiences. I do recall him mentioning going to the London docks, and I am pretty sure he made one trip to Coventry. He also told a story about leaving his bunk at the fire station at some point and returning to find a big lump of shrapnel where his head had been. I also recall that the firemen made toys during slow periods, and that they held a Christmas party where these were distributed. I got a doll's table, but really coveted a bed. In her memoirs our mother (Marion Burrows 1909 - 2003) recalls that dad was only home about twice a week during the war years. dad grew up in Epsom, attended Sutton County School for Boys, and spent most of his adult life in Banstead, working at the Queen Elizabeth Hospital for Children after the war. He also made an unsuccessful attempt to run for the local Council as a Liberal candidate in the late 1950s. I joined the full time Fire Service in 1941. I had done part time, unpaid work before that, but the time was coming for my age group to be called up for full time service. I asked Company Officer Rose if he needed any full time personnel and he said, "Yes, you can come full time next week if you like". At that time it was the A.F.S. 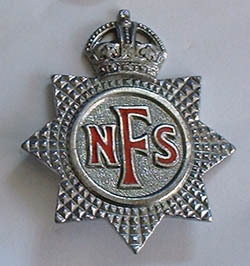 Auxiliary Fire Service, it was to become N.F.S National Fire Service in the autumn. This meant equipment and personnel should be standardised, because they had found hose and other equipment had been sent to fires in the blitz and were useless because they did not fit. Also messages should be made the same everywhere as mistakes had been made through choice of words. When I joined full time I was given a uniform, tunic jacket, cap and shoes, black tie, we wore our own white blouse and stockings. When we became N.F.S. 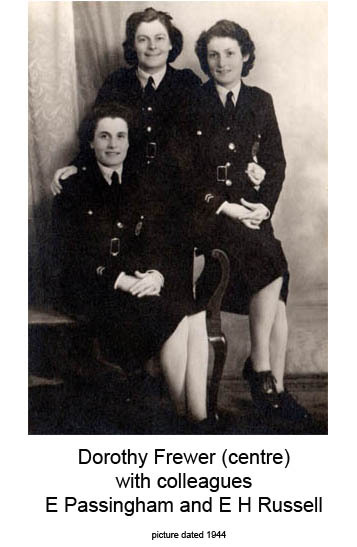 overcoats and raincoats were added and slacks which were for night duty and extra blouse and two pairs of shoes. They brought all this clothing in a van, before we had to go to a store in Croydon. When I first started a lot of the fire men were busy with loft clearance. An order had been made that people's lofts should be cleared, because it had been found that an incendiary device could penetrate the roof and because of the storage of paper and inflammables in lofts the house could be set on fire. Unfortunately because of the call up of young people, many homes were left with elderly people who could not clear their lofts. Our fire men cleared loads out of many homes, sometimes unusual things like the day two fire men came back and between them they had a full sized stuffed bear. The lady of the house was surprised to see this being carried down the stairway as she had no idea it was there. Another task which took time was we had many static water tanks positioned where mains water was not always easily available. This had to be kept topped up and rubbish removed. It is surprising how people will throw things in water, which may have blocked a hose when in use, and these one day included a sewing machine. The Fire Service was very much like the Navy and we were in three watches, Red, White and Blue. Two were on duty one on standby. We worked 48 hours on day, 24 hours off (or standby if air raids happened). Change over was 1000 hours (24 hour clock) it was a full roll call in the station yard and any notices given out. When we went on duty at 1000 hours we were in the Watch room till 1700, be relieved for lunch. We had a switch board and 2 books to keep up to date for 3 people, an occurrence book, a movement book of all personnel and vehicles, so it was known where any of these were at any time. We had a fire escape and 4 pumps when I first went there, to later become 6. They were sending an escape to all calls and a pump, till it was known to be a waste, when it was not really needed. From 1700 hours to 2130 we were free except to relieve watchmen for evening meal. We were in watch room till morning at 8. If there were no incident, 2 people were up in watch room; the 3rd could rest on camp bed in room adjoining. After breakfast on our 2nd day we could go to bed on bunk beds till 1230 then we had midday meal; we could have 'short leave' and could leave the Fire Station till we were relieved for breakfast. After 1000 roll call we could leave the Fire Station for 24 hours. Every 3 months we had an extra 24 hours off duty making 4 days. I cannot remember what the pay was but it was about twice as much as my sister Elsie received in the Land Army. We had to know the geography of our area very well; as I had always lived in Banstead where I was based I knew it all. Because the N.F.S. personnel on the east coast were finding life difficult, shells across the Channel and bombs, it was decided to send some of us unmarried girls to help for 6 weeks at a time. Of course we did not know where we were going, but I got sent to Tankerton near Whitstable. By this time I had been made a mobilising officer, before they had all been men, but they took them out of the watch room and put them on more active work. I was trained in 3 weeks, with another girl we went to Surbiton. We also learned some systems which were quicker than the old ones. When we got the 'doodle bugs' or VI's in 1944 this did pay off. When I got to Tankerton I had to learn the geography and to know the streets and roads. This took time but I had a good memory then. I can remember 30 at a time. When I had leave in the afternoons I went out and walked different areas to memorise them. There was another girl from London Area with me, she was on a different watch, but we could help one another in various ways. We were lucky because there were no bad incidents while we were there and only one of our planes which was damaged and just made it over us and then crashed and killed the pilot. When I returned to Banstead I think I had a good report, for they all seemed pleased. (Dorothy was married to Fred Frewer 23rd December 1943). Soon after, the flying bombs, VI's started and we were busy at the Fire Station. They fell all around us and we had lots of fires. I got very tired; when I was home I slept in the downstairs shelter. For days tanks and equipment were going down the Brighton Road to the coast. The weather was bad when they did start. Fred had been home and we were on our way to Banstead Station for him to go back when we saw the sky full of planes and we knew it had started. Fred went across when it was still very rough. I was not to see him for 8 months. Gradually the doodle bugs stopped as the troops took over the sites. Fred had been home when V.E. Day came but he still had to go back to Germany. I saw him off at Banstead Station and as I walked back along Brighton Road people were lighting bonfires and in Diceland Road they were having a street party. It was good to know that that part of the war was over and we could have peace. I left the London Fire Service in 1945. Four years of effort. Before I left the service I was invited to go to Fire Force HQ in London where the Queen and Princess Elizabeth came to thank us for our efforts. I was the only one from our area to go. I was surprised to see the princess was as tall as her mother. We had a nice lunch then the royal couple walked round. We were entertained to drills on land and on the river.